You come across a huge deer on your travels through the Beastlands. 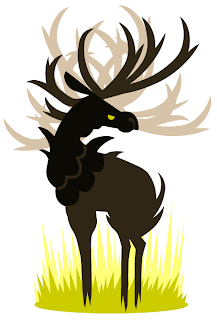 It stands four times taller than a normal human being and antlers sprout not only from its head, but down its neck to its haunches, giving it a coat of grand bony spears. You're confident in the strength and tactics of your party as you charge through the bushes, where you surround the surprised Gaspar. It can't run anywhere without being met by fences of spears and swords. As you raise your weapons to pierce its comparatively soft underbelly, the Gaspar rears up and slams down. There's a golden light and you can't see your quarry anymore, nor the eternal afternoon sun of Kirgala, nor the ancient trees of the Beastlands. The Gaspar didn't leave, but you did. Drawing by Adam Vian of Super Flash Bros, since I'm currently trying to get my old laptop to cooperate with me and Photoshop. I really like this pic, it just strikes a chord with me and the accompanying write up really sets it up.